White noise fans provide a steady hum of frequencies. They are the best solution for those who need some background noise to be productive and relaxed. Just like some people function better when surrounded by complete silence, there are those who need some background noise to be their most productive and relaxed self. White noise, as a unique blend of sound frequencies, is the perfect solution for both types of people. People who need peace and quiet will benefit from listening to white noise because it actually cancels out other, more jarring noises. For example, if you have a steady flow of noise coming from outside of your window, the constant humming of the white noise will mask more irregularly occurring sounds, like banging or conversation. And let’s face it – we’ve all fallen into the trap of starting to sing when we should have been concentrating. People who need music to work or fall asleep often don’t realize that they really shouldn’t be listening to music with lyrics. With classical music, we can hum along to the melody – but white noise gets rid of all distractions. In this article, I’ll explain what white noise fans are and which features you can expect to see in them. I’ll also present a short list of the best products currently on the market. So, let’s get into it. What is white noise, anyway? I mentioned that it’s a blend of sound frequencies, but it’s actually not as simple as that. White noise, like white light, is an amalgamation of all sound frequencies. That means white noise is a mix of all frequencies between 20-20,000 Hz. White noise plays all of the frequencies at the volume they come in, which makes it a bit sharper at the high-frequency end of the spectrum. By playing all of these sounds, white noise can cover up all other sounds that happen in that range. If you’ve been researching white noise, you may have also heard of pink or brown noise. They work within the same spectrum as white noise, except that they’re both more balanced between the low and the high end of the spectrum. Choosing the right noise color is just a matter of personal preference. So, what are the benefits of white noise fans? There are many types of white noise machines, but fans have the obvious dual-purpose advantage. Aside from being able to keep you cool – which is also a big part of concentration and sleep – they are often very portable, as well. And, fans are even way cheaper than white noise machines, anyway. Before you load that Amazon page, you’ll need to figure out where you want to put the fan. Depending on which room you intend to use your fan in, you’ll need a different product. And, of course, you’ll want to pay attention to the features of the fan. These could also determine if you can place it on the floor or a desk. So, ask yourself which problem you’re looking to solve by purchasing a white noise fan. If you’re trying to get a better night’s sleep, for example, you’ll need to consider what your room looks like. Do you have space for a standing fan, or do you need to settle for a smaller one you could put on the nightstand? Are you trying to help your baby have a more restful sleep? A smaller fan would probably do well there, too. There are options for people trying to cool down a whole room, or for those who want to be able to personally direct the airflow by hand. The point is that potential buyers need to shop for their own needs, not just pick out whatever’s the cheapest or most expensive. I’ll have some suggestions for each of these categories later down the line. For now, we can just move on to the features you’ll need to look out for when choosing the best white noise fan for your needs. 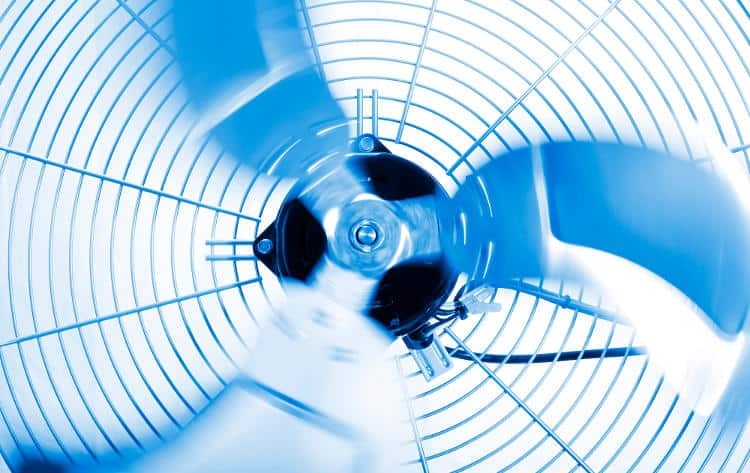 There are some basic features you should be aware of when shopping for fans. Here, I’ll explain the different types of fans, as well as the various qualities you might want to pay special attention to, including loudness, portability, and airflow. Lastly, I’ll try to cover the quality of materials and the price of fans. However, there are a few more aspects I might not get to. Like, some of you might already be loyal to a certain manufacturer, or you might be looking for certain features. For example, you could want your fan to have a sleep timer. Honestly, it’s always best to write down everything you’re looking for before setting out to find the right white noise fan for yourself. So, let’s see what considerations you might want to have. As I mentioned, you’re bound to notice a few basic types of fans when shopping for one. So, let’s see what the three most popular types are. First, there are ordinary fans. These are your standard, noisy, standing fans. They have a fairly large and stable base. The head of the fan might turn from side to side, directing airflow, and the round blades of the fan are protected by a grill. Another type of fan you would see is the tower fan. These are also standing fans, although they’re slimmer than ordinary fans, so they take up less space. They also don’t have a rotating head because their blades are hidden inside the tower body. These fans are a great option for small apartments or bedrooms. Box fans are typically small and easy to use, though some of them can be industrial-size. They can be square, rectangular or circular, and they don’t typically have moving parts. However, you can move them by hand, since they’re often small enough to be handled. Also, they can go on the floor, like ordinary and tower fans. Or, they can be so small that you could put them on your desk while you work. And, they could even work by a window and direct the room’s airflow. Actually, box fans are usually the crowd favorites for people who like having white noise around, as they tend to be noisier. For people who want to sleep with a white noise fan, it wouldn’t need to be incredibly loud. However, if you’re looking for something to cover daily noise, you’d need a louder fan. The loudness of a fan is usually due to its speed features, so make sure to check them before purchasing a fan. The portability of a fan would naturally be determined by its size and weight. There are some fans you could easily handle – like smaller and lighter box or tower fans. Some ordinary fans can be moved between rooms, but you’ll probably want to keep them in one place. You could even take smaller fans, and those that come with their own power supply, to the office. Or, you could even bring them with you when you travel. One of the smaller fans I’ll talk about later even has a clip, which makes it especially travel-friendly. Obviously, the primary purpose of a fan is to provide airflow. In order to make sure that the fans you’re looking at will be good at directing airflow, you should compare how powerful they are and make a choice from there. 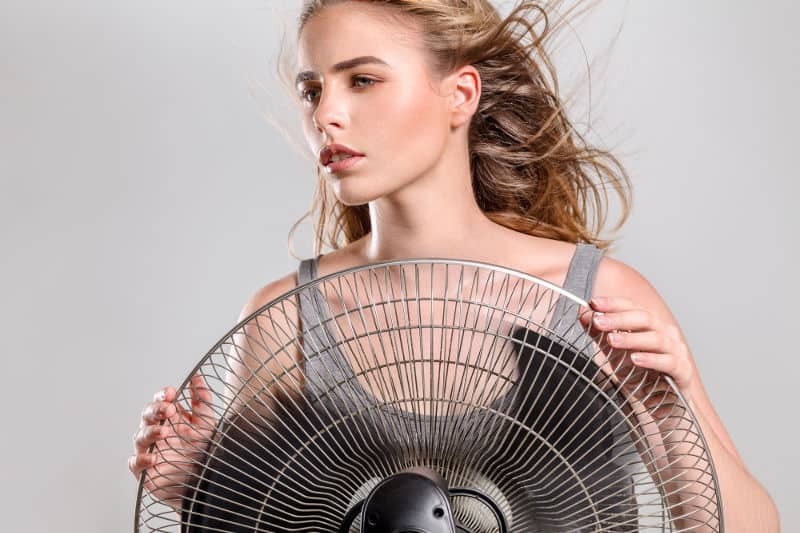 Depending on your needs, you might especially want a fan with an oscillating head or some other way of mixing up the air in a room. Or, you might specifically want a stationary fan to blow directly in your face. Whatever your preference, it would be a good idea to write it down before you go looking for fans. The quality of materials in a fan is super important if you want it to last a long time. And, I’d say it’s especially important in smaller fans – so, the ones you want to carry around with you. Personally, I think you could make even a middle-tier quality fan last if you take care of it. That shouldn’t take much; just don’t trample the cables and avoid rough handling. You should also cover it with a bag before you set it away for the winter, if you’re not using it. Still, if you want something you can be sure will last, I’d suggest making sure a fan isn’t made of cheap plastic before you buy it. Of course, most of the time, durability might come at some expense – literally. I’d say having a higher-quality gadget is worth a steeper price point, but that’s for everyone to decide for themselves. Fortunately, the fans I’ve chosen to talk about are all within the 20-100 dollar range, with most of them sitting comfortably at the lower end of that spectrum. Naturally, the smaller fans are typically less expensive, though even similar fans’ prices might vary between different manufacturers. So, as always, decide how much you’re comfortable spending and go from there. Now that we know what to look out for, I can finally present my list of the seven best white noise fans on the market. These are all white noise enthusiast-approved, so they all produce a great whirring noise to help you sleep and concentrate. The specifics will be left up to everyone’s preference. So, without further ado, let’s see our contestants! This OPOLAR desk fan is a 6-inch tall box fan that comes with two power supply options. You could plop it down on your desk and plug it into a computer or power bank using a USB cable. Of course, it can also be plugged into an outlet with an adapter. Or, you could leave it up to the rechargeable 3350 mAh battery, which should last up to 10 hours. OPOLAR’s fan may be tiny, weighing in at only 7.8 ounces, but it packs a lot of punch. It can be set to three speeds, with the maximum speed being 3200 revolutions per minute. That should be enough to produce a comfortable humming noise without bothering other people in the room. And, it will be great for sleeping. As the name of the product states, it’s completely portable, and as it doesn’t need to be plugged in, you could even direct the airflow yourself by holding it up. That isn’t to say that it can’t be put down – in fact, the base of this fan is very sturdy. It also has LED lights on the inside and sides of the fan, which means that it can serve as a handy reading light on your camping trip, or as a night light in your home. Since it’s such a small product, this OPOLAR fan only costs about $20. Vornado’s 683 is an ordinary standing fan made to improve the airflow of a whole room. It’s among the priciest products on this list, coming in at around $80 on Amazon. In my opinion, the price is completely justified, as it comes from a tried-and-true fan manufacturer. Vornado has perfected their own energy-efficient “vortex” technology, which promotes air circulation. The height of this fan is adjustable, between 32 and 38 inches, which means it shouldn’t overwhelm smaller rooms. Its head is stationary but adjustable by hand, as well. Wherever you fix it, though, the deep-pitched blades and grill are supposed to be able to push the air to all corners of the room. The fan is fairly easy to assemble and disassemble, which should make it easy to store. However, I would say it’s one of those “set it and forget it” products – I wouldn’t move it around too much once you have it set. Like most fans, it also has three speed settings. In fact, the 683 is a fairly standard product all around. However, Vornado is also pretty famous among people who like to have white noise around. The brand’s fans are great at providing non-distracting background noise, and one user commented that the fans themselves are actually noiseless, allowing you to hear the air circulation, instead of the blades. Lasko is another well-known brand among people looking for white noise machine alternatives! This particular fan is a 20-inch wide circular box fan that you can use as a floor fan. Or, you could even mount the fan on your wall using a stand. And, you’ll easily be able to switch between using it on the floor and on the wall because you won’t screw in the fan itself. Like the previous fan I mentioned, this Lasko fan is one of the pricier ones on the list, as it costs upwards of $60 on Amazon. Also like the previous fan, this one’s more expensive – for a good reason. Though it doesn’t have any fancy airflow technology, the metal frame of this fan is very durable, which means it should be able to take a bit of rough handling. It’s big, stable and sturdy, but still easy to move around. And, as I said, this brand is famous among white noise lovers. That’s because it’s a particularly powerful machine – and where there’s power, there’s noise. So, this fan is great for white noise. The low setting will produce a quiet whirring sound that would be great for sleep, while the medium and high settings will be great at disguising louder sounds. Lastly, like all Lasko products, it has their Blue Plug technology, which protects against electrical hazards. Unlike the last Lasko fan, this one was also made to conserve space, as well as melt into it, with its sleek curved design and wood accents. This tower fan is only about 13 inches in diameter and 42.5 inches tall. It weighs only about 13 pounds, too, which should make it easy to carry between rooms using the built-in handle. And, it’s in a similar price range as the past two products, as it costs upwards of $80 on Amazon. This fan has three speeds, which is standard, but it also has oscillation settings, all of which can be controlled with a small remote control. And, it even has an ionizer included, which can improve air quality by trapping air pollutants. The 2554 tower fan also turns off automatically after 7.5 hours of use, and it even has other timer options. A tower fan may not be the best option to direct airflow in a bigger room, but it’ll work just fine in smaller spaces. The oscillation settings will help there, too. And, since you’re trying to find a white noise fan, I should mention that the powerful oscillation will also produce the whirring noise you need to work or sleep. This is pretty much the ideal fan to have if you’re concerned with saving space or having it fit into your other decor. And, it should be even better at making white noise, and generally improving air quality. My last three recommendations take us back to the personal fan categories, starting with the 6-inch, 1-pound Vornado Flippi V6. Unlike the first personal fan I mentioned, though, this one doesn’t have USB or battery power. Also, these last few options take us back down to the $20-$30 range on Amazon. The Vornado Flippi is so called because the head of the fan can be manually adjusted 360 degrees around the stand. When the fan is pointed down toward the stand, you can basically pop the fan in your bag and get going. Because of its size and unobtrusiveness, you could even bring this fan to work or maybe school. There are a lot of color options to choose from if you like your gadgets tiny and whimsical. Like the previous Vornado product I presented, the Flippi V6 uses their signature vortex technology to promote air circulation. Like other small fans, though, it doesn’t offer a huge variety of settings, leaving you with just two speed options. Still, I’d say these are perfectly acceptable for white noise production, especially if you’re trying to sleep, or work in a work environment that’s already decently quiet. Here’s another OPOLAR box fan, if you aren’t sold on the first product on this list. Unlike the first OPOLAR product I mentioned, this one isn’t battery operated, though it can still be plugged into an outlet adapter (which comes with the fan), computer, or power bank via USB cable. And, with this product, you’ll still be shopping in the $30 range on Amazon. This 8-inch square box fan has four speed settings and an additional “natural wind” setting that varies between 500-1200 rpm. The fan even has timer settings, so you can set it to shut down after 1-8 hours of use. I imagine this setting is great if you want to put the fan on your nightstand and forget about it. The fan is thick enough to be able to stand upright on its own, but you can also use its 90-degree adjustable stand to point it at your face while you’re working at your desk. The tiny fan has seven blades that ensure good airflow and a “brushless motor” to reduce the noise. Not to worry, though, because as I mentioned, the white noise doesn’t actually come from the blades, but from the airflow. And, since the speed settings are fairly decent, this fan should at least produce enough white noise for you to fall asleep and stay asleep. Finally, the last personal fan I can recommend is this compact O2COOL battery-powered clip fan. It’s just under 12 inches long with the 5-inch clip, though the actual head of the fan is 5 inches wide with a 1-inch circular frame. The head is fully adjustable, so you can rotate it about 330 degrees or tilt it 130 degrees. So, wherever you clip the fan, you’ll be able to manually direct airflow towards yourself. The clip is also very strong and won’t budge easily if you end up using the fan in a workshop, or other areas with more foot traffic. The O2COOL portable fan is exclusively powered by AA batteries, and it has two speed settings. You shouldn’t be able to hear the blades operating, but this fan should serve you well as far as white noise and airflow go. O2COOL recommends using this fan on your desk or in dorm rooms, in offices, or on camping trips. Finally, this portable clip fan is available for about $25 on Amazon. So, even if you didn’t find the perfect white noise fan for you in one of my recommendations, by this point, I’m sure you know exactly what you’re looking for. Since white noise is so helpful, whether you’re trying to catch up on some Z’s or concentrate on your work, everyone would benefit greatly from having some kind of a white noise machine at their side. And, why not make it a product that can also help you stay sane in a hot or stuffy room? While we’re on the subject of improving sleep and overall quality of life, I’ve got one last tip for you all. Fix your sleeping conditions sooner rather than later – if there’s something about them that needs to be fixed. A white noise fan or machine can only help so much if you’re sleeping on a mattress that’s sinking or, God forbid, poking you. Because, remember, in order for you to be able to concentrate on your work or studies at all, you’ll need to get plenty of sleep, anyway. So, while a white noise fan can actually help you in both of these areas, it’s best to make sure that your room is already quiet enough and that your bed is already comfortable enough. I hope this helps you change your environment for the better and improve your sleeping and working conditions. Any of the fans I listed are sure to help you with that, but if nothing else, at least you’ll be a bit more informed about white noise fans in general.